Is the WORX Chainsaw any good? Well, in short — yes! I don’t want to keep you in suspense. The WORX chainsaw is one of the most popular electric chainsaws for homeowners that you can buy at the moment and for good reason. It’s a well-made chainsaw with enough power to tackle those cutting jobs around the yard. But more than that, it’s also very easy to use and packed with some great features; all at a very affordable price. Yup, it’s possible. The reason why the WORX chainsaw is so cheap is because it appeals to a large consumer base, allowing WORX to mass produce it — passing the savings onto you. I’ve included the different variations of the WORX chainsaw in many other articles that I’ve written but now its time to give the WORX chainsaw it’s own feature article — it’s well deserved, and long overdue. If you don’t know already know, WORX is a brand owned by Positec, a Chinese based company. Don’t let that scare you. Not everything made in China is cheaply made. You know the iPhone is made in China, right? Ok, so let go of your bias. Excellent products come out of China and that includes the WORX chainsaw. WG303.1 — ergonomic and easy to operate. The WORX brand has been around since 2004 and has been growing steadily ever since — competing directly with Black & Decker and other popular brands for quality and reliability. I have to admit, WORX is an innovator when it comes to home yard tools. Now, let’s have a look at the WORX chainsaw in more detail. There are actually two different models but they’re essentially the same except that the WG304.1 is slightly more powerful and has a bigger bar and chain. Other than that, they’re identical. Designed for homeowners. Great value for the money. Ideal for: Felling trees and wood up to 12-inches. Excellent for limbing and cutting firewood. The WORX Chainsaw WG303.1 is extremely popular corded electric chainsaw. The first thing you’ll notice when you hold it in your hands is that it feels comfortable; designed to be ergonomic and easy to hold for long periods of time. Let’s face it, chainsaws are one of the most dangerous tools you can buy so comfort is extremely important. Not only that, but it’s quite lightweight at only 11 lbs. Thankfully, WORX has included a chain brake, which essentially means that if kickback occurs the chainsaw will automatically shut off, protecting you from injury. This is an important feature that every chainsaw should have, but unfortunately, cheaper chainsaws often do not include this safety measure. Also, you won’t have to worry about tightening your chain if you decide to buy this WORX chainsaw as it comes with an auto-tensioning system which simply works on its own. You don’t have to fuss with tightening the chain. Since most homeowners don’t understand how a chainsaw works I think WORX has done a great job in keeping the needs of their customers in mind. WORX is a company that excels at creating products that simplify the task at hand with their unique technology and approach to design. The WORX TRIVAC is one good example of what I mean — it’s a blower, a mulcher and a vacuum! WORX designs their yard tools to accomplish a variety of related tasks — instead of trying to sell you 3 tools they combine them all into one. Their products are truly innovative and I believe that other companies are paying attention. The WORX chainsaw auto-tensioning system will also extend the life of your bar and chain life by eliminating the possibility of over-tightening. Metal bucking spikes are included with the WORX electric chainsaw, allowing you to work safer. If you don’t know, bucking spikes are used to grip the wood and provide you with a pivot in order to balance when working with your chainsaw. The WORX Chainsaw WG303.1 has a 16″ bar and chain with an easy-to-lubricate sprocket on the bar nose for increased longevitity. This saw is powerful enough for the majority of tasks around your yard, producing 3.5 Hp at its peak. Overall, this is an excellent chainsaw for small to medium-duty cutting around the house. Don’t expect it to fell large trees. It’s not designed for that. If you want a lot of power then you’ll have to upgrade to a gas chainsaw. I recommend something like the Husqvarna 455 Rancher as it’s one of the best all-around gas chainsaws for homeowners. Rear view of the WORX chainsaw. The WORX chainsaw comes with a 3 year warranty to give you peace of mind. Three years is an indication that the manufacturer stands behind its products. Just don’t abuse it. Don’t force the chainsaw. Let the saw do the cutting. If you force this chainsaw too much when cutting wood you’ll eventually burn out the motor. Be patient when working and you’ll be extremely satisfied. Deserves to be at the top of the best chainsaw list for consumers. Buy the right extension cord! Make sure you have the right extension cord to run the WORX chainsaw (WG303.1). If you want a 100-foot extension cord then make sure that it’s 12-gauge, like the US Wire 74100. Longer is better but if you only want a 50-foot extension cord then you can use a 14-gauge cord like the Coleman Cable 02408. If you want to learn more about extension cords then read our Extension Cord Buying Guide. Great for most sized yards. If you don’t use the correct the optimal extension cord your chainsaw will run with reduced speed and will run hotter, reducing its lifespan. I feel that this is one of the best chainsaws for people who don’t want to spend a lot of money but still want to take care of all of their yard cutting projects. Whether you need to cut firewood, fell small trees, clean up after a storm or do some limbing, this WORX chainsaw is a solid performer that should serve you well over the years. Get a closer look of the design features. Learn more from Amazon. By the way, this is the top selling chainsaw on Amazon for a reason — it’s really good! View or Download the MANUAL for the WORX Chainsaw: WG303.1 / WG304.1. It’s the same manual for both models. That’s it! All of the features are exactly the same. If you want a little more power then buy the WORX WG304.1. WORX JawSaw WG320. Powered by a 20V Lithium-ion battery. The WORX JawSaw WG320 is another innovate tool that truly fills a void in the market. I consider it a chainsaw replacement for people who aren’t comfortable using a chainsaw — I know that they’re are many of you out there. Once again, WORX is looking out for consumers. As a company they understand that using power tools isn’t natural for many people and in fact, it scares many homeowners. 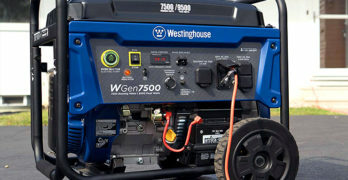 The WG320 is powered by a 20V Lithium-ion battery. There’s also a corded electric version (WG307) that you can read about in the next section. Personally, I love the versatility and freedom of battery operated tools. I don’t like cords very much, but that’s a personal preference. Battery tools are more expensive but you also have complete freedom of movement. That’s the tradeoff. I definitely recommend buying an extra battery, especially if you want to work uninterrupted. The JawSaw looks scary but it’s actually a much safer way to cut small branches and trees under 4-inches. Yes, that’s the limitation of the WORX JawSaw. Unfortunately, it’s not capable of cutting above 4″ but if all your cutting needs can be handled with the JawSaw then I recommend that you buy the WORX JawSaw instead because it’s safer. I can’t stress how important safety is when you’re working with tools in your yard. Whenever you have a choice to make, choose the safest, even if it’s more expensive. What’s your life worth? I’ve already written a full review of the WORX JawSaw so if you want to know all the details then read my original review. I just had to include the JawSaw in this review of the WORX electric chainsaw because if you’ve never heard of the JawSaw before you’ll probably be happy (and surprised) that such a tool exists — I know, because I was taken aback when I first discovered it. Black & Decker has their own chainsaw alternative that they call the Alligator Lopper, which has also been reviewed here at Chainsaw Journal. Honestly, I feel that the WORX JawSaw is the perfect cutting tool for people who — for whatever reason — are unable to use a chainsaw. It’s much safer and easier to use. The only drawback is that it can’t cut anything larger than 4 inches. View or download the MANUAL for the WORX JawSaw (WG320). Automatic tension system guarantees optimum tension. Scissor cut action limits dangerous kickback. Automatic chain oiling system with oil level indicator. Blade housing allows for safe cutting on the ground. WORX JawSaw WG307. Corded electric. The Worx WG307 is the corded electric version of the JawSaw. Again, the features are the same it’s just powered differently. The WORX JawSaw is the best chainsaw alternative that you can buy right now. View or download the MANUAL : WORX JawSaw WG307. View or download the QUICK START GUIDE : WORX JawSaw WG307. NOTE: Do not cut limbs over 4” in diameter. Enclosed bar and chain for added safety. Scissor cut mechanism reduces kickback. Jaw design easily grabs for stability. Automatic chain lubrication with oil level indicator. Perfect for quick cleanup after a storm or for pruning. No need for a ladder. Prune from anywhere. The JawSaw WG308 is a package that includes the 20V battery powered WG307 model with the extension pole attachment, allowing it to extend the JawSaw’s reach up to 12 feet. Perfect for pruning and cutting those far away limbs. This is a great choice if you have a lot of cutting to do up high. It’s a safer way to work. The extension pole requires no tools to attach and can be removed in seconds. You get the best of both worlds with this JawSaw package. If you already have a WORX JawSaw you can simply buy the extension pole attachment (WORX WA0163) for it and you’re ready to go. I like companies that provide you with useful accessories. As I said early in this article, WORX provides a lot of value to their customers. Solid construction and made from durable materials. WG308 = model WG307 + (extension pole) WA0163. Cuts limbs up to 12 feet high.